While Infinix grows further as a smartphone making company, they are up and active to very soon launch their latest Infinix smartphone and add one to the “Hot” series of Infinix smartphones. 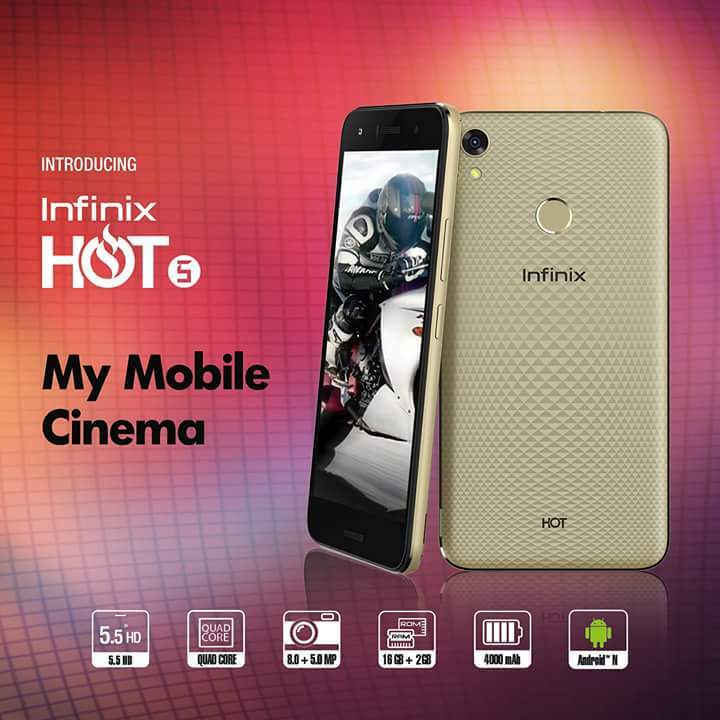 Following the launch of the Infinix Hot 4 in the month of September 2016, which was a very successful launch, Infinix Hot 5 Lite, Infinix Hot 5 and Infinix Hot 5 Pro are the latest members in these Series. Infinix might be looking forward to making a big launch in 2017 (probably the Infinix Zero 5) as they are continually orchestrating how to leave the competition behind. But before that release, they have rolled out the latest in the Hot series of smartphones. Despite the release of the Infinix HOT S3, Infinix Hot 6, and The Infinix Hot 6 Pro, the Hot 5 is still a king in its own right. We have all the information about the Infinix Hot 5, Hot 5 Lite and Infinix Hot 5 Pro (codename: Infinix X559) via reliable sources. With the launch of this new device, Infinix Mobility will be aiming to replicate the immense success of the Hot 4 which was one of the best budget devices of 2016. Therefore, in the spirit of new releases, let’s take a quick look at the specification of these new smartphones: the Infinix Hot 5, Infinix Hot 5 Lite and Infinix Hot 5 pro. As the Hot 4 was launched in September last year and the Infinix Hot S launched in the month of July. So we may expect the Infinix Hot 5 and Infinix Hot 5 Pro to be released in August 2017. Alas, the Hot5 Lite and Hot5 have both been released in August 2017. The Infinix Hot 4 has a body dimension of 155 x 75 x 8.1 mm and weighed 175g. So the Infinix Hot 5 has followed in the same footprint as its predecessor. The three variants of the device all sport the same screen size. The body of the three phones showcases a premium plastic design with a rough surface to ensure an easy grip. The hot 5 is available in red, grey and champagne gold colours. The device also sports a fingerprint sensor just below the rear camera. However, unlike the Hot5, the Infinix Hot 5 Lite does not have a fingerprint sensor. 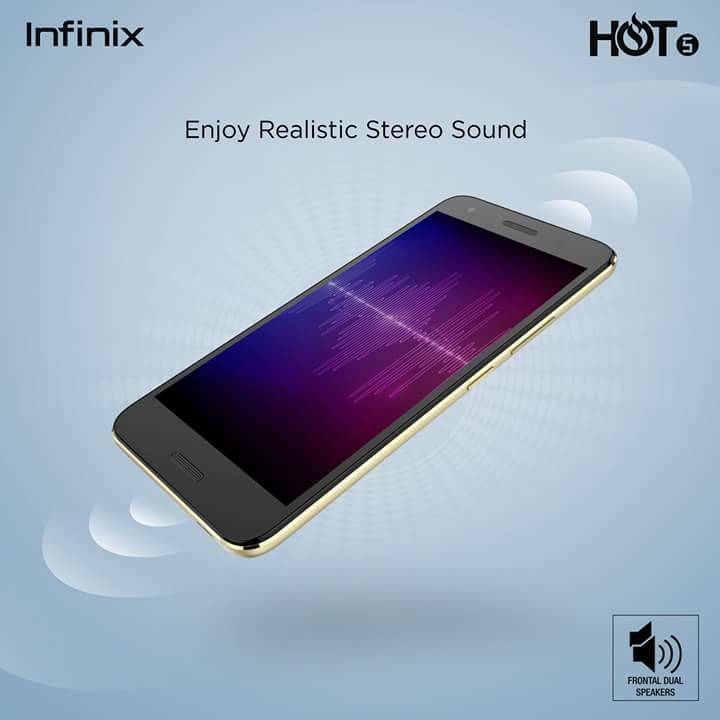 The Hot 4 had a 720p HD display which is acceptable at the price line at which Infinix provided the phone. The news emanating from our sources have revealed that the Infinix Hot 5 and Hot 5 Pro come loaded with a 720 x 1280 pixels HD display. The Hot 4 had a screen to body ratio of 71.7% but we had expected the new device to do even better. Unfortunately, the same screen to body ratio applies to the Hot5. Let’s remember that most smartphone makers are looking to build a display with minimum or no bezels at all. The Infinix Hot 5 is also expected to sport a 5.5 inches’ screen while the Infinix Hot 5 Pro may go big and have a screen of size 5.7 inches. The Infinix Hot 5 and Infinix Hot 5 Pro are expected to run the latest Android version 7.0 Nougat with Infinix’s custom interface, XOS Chameleon V2.2. The Infinix Hot 4 had the huge none removable 4000mah battery. Well, that’s a lot of power. Infinix Mobility has decided to stick to this mammoth battery size by featuring similar specs in the Hot 5. So the Infinix Hot 5 and Infinix Hot 5 Pro might have a 4100mAh battery and 4500mAh battery respectively. And like previous releases, the batteries would be non-removable. In the camera department, the Infinix Hot 5 and Hot 5 Pro are expected to exceed the 5MP front camera that was available in their predecessors. Unfortunately, the Hot 5 will sport a 5MP selfie camera with wide-angle lens for better group selfies. The rear camera will also be 8MP with LED flash as found in the Hot 4. This is somewhat disappointing as we had braced ourselves for improved camera specs. Infinix has continued their relationship with MediaTek Processors. The tech giant has continually supplied the engine of most Infinix phones. The Infinix Hot 5 and Hot 5 Pro are both running on Helios processor alongside Mali GPU, which is a quad-core 1.3 GHz processor. The Infinix Hot 5 & Infinix Hot 5 Lite bot sport a 16GB internal storage space. They also have a memory card slot that can accommodate up to 128GB of external memory. The RAM has two variants, 1GB on the Hot 5 Lite and the 2GB variant for the Hot5 & Hot5 Pro. There is a dedicated expandable SD card slot which will be expandable up to 128 GB. Like the Hot 4, the Infinix Hot 5 and Hot 5 Lite will not support 4G LTE. However, the Hot5 Pro will support 4G LTE. Both phones are coming packed with all basic sensors like Accelerometer, Proximity and Light Sensors. For security, we have the fingerprint sensor. For the phone’s retail price, it would make sense that Infinix will deliver a premium build phone at an affordable price. That’s what the Hot series is about. The Infinix Hot 5 price in Nigeria starts from #32,000 depending on where and when you purchase the smartphone. Buy online by visiting the top eCommerce stores in Nigeria. One thing is sure, Infinix Mobility is set to continue the trend of releasing an affordable phone that has most of the features you will find in their flagship devices. These devices provide good value for money and consumers and fans get to purchase the best at an affordable price. The Infinix Hot 5, Hot 5 Pro and Hot 5 Lite have finally arrived. We can only sit still and watch how the Infinix fan base will react to this latest release…Check out the new Tecno Camon CM for that extra camera advantage.